The Oscars are over and Spielzeugland (Toyland) won best short film. It’s a story about the holocaust which by all accounts is very powerful, and of course, it’s subject matter is always going to play well to Hollywood folk. Slumdog swept the board, and I am particularly delighted that my old film school buddy, Chris Dickens won for editing Slumdog. Chris cut my film school graduation film (Captain Zap – a half hour narrative about a kid who draws Conan the Barbarian style comic strips), and then did the sound editing on my first feature The Runner. He is an incredibly nice chap and it was good to see him up there on stage collecting the little gold chappie. Well done Chris! I am sure in due course I can convince him to come and chat to us about his experiences and what it was like going to the Oscars! Over the last 8 hours, I have received an enormous amount of texts, calls and emails. They were from across the whole planet, some from cast and crew, some from friends, other from people who have been following our adventure, and a surprising amount from professional film makers, writers and directors. I really am gutted to see Gone Fishing wasn't nominated. The disappointment of that aside though, you only have to look at the blog to see how many people the film has touched and inspired, which is a huge and admirable achievement in my humble opinion! On a personal note, you've been a massive inspiration to me, and done a hell of a lot for me, and I'll always be hugely grateful to you for that. You really inspired me to kick my life off in an entirely new direction, and if you are feeling a little bit rubbish at having not been nominated, I hope you can take a bit of solace in the fact that you can affect people in that way. Chris, before the general storm of the day began yesterday, I wanted to tell you that your regular emails are one of the few regular mailouts that have real value in this world. Yesterday's email came as the creative waters were "still" momentarily (not a bad thing), and I marvelled at what a great service you do by keeping us connected. It helps us all (including you, I hope). No time right now to go into details, but your blog is value-full and your journey important, noted, and inspiring. Thank you for your leadership! Let's continue to sail the ship together, Monsieur le Capitain! Always, always, always it's ONWARD AND UPWARD!!!!! This has brought a tear to my eye. You so deserved to be nominated with Gone Fishing. I am truly sad today. I heard the nominations coming through and went straight to the Oscar site to see. I kept checking and rechecking in case I had missed it. I just can’t believe it. I sat all my family down to watch the film on Christmas day and they loved it. It brought a tear to many of their eyes. I am really sorry you did not clinch this. Good luck with all your future projects! It’s been a fantastic journey and I shall be watching your future activities. You are truly an inspiration. There are not many film makers out there who would share their journey in the way you have done. We have all been with you on this and I am sure we will all be with you on your future exploits. I just wanted to say jolly well done. You made and ran a stonking campaign, became an even more inspirational filmmaker than you were already (not an easy task) and for a while you enabled people to believe in a dream. With so much politics involved, so much money thrown at campaigns, brunches and industry screenings for recognition, it's a tribute to you that you made the final selection. Bloody well done! Right, it’s time to put the news in the past, and focus on the present and future. Over the coming weeks I will be announcing the new projects we are rolling out in 2009. OK, so Gen and Zee are about to take me to their favourite Curry House in Santa Monica for what promises to be an extremely over indulgent dinner. Great! ‘Cos I am starving! After watching live around the globe, many of us dashed to our computers to get to Oscars.com… If you don’t know by now, Gone Fishing was not nominated. We were in the official shortlist of ten films from which the five nominations were drawn. But the judges placed us somewhere between film number six and ten. We got notification about this Official Shortlist last December, but we were told that we could not announce it or tell anyone. It’s a sad day for us all, but let’s not linger here, let’s regroup and see what new horizons await Gone Fishing and what new and exciting projects await us all… As the Oscars chapter closes, a whole new chapter of Exciting Possibilities has just opened, and I just can’t wait. Onwards, and if ever there was a time to say this, UPWARDS! It’s 3.00 am in LA and the Oscars are announced in 2 ½ hours from now. I am feeling rather calm all things considered. What will be, will be I guess. I have had a cacophony of text messages ringing in my ear all night, from well wishers and nervously excited collaborators too. The same on email. All of them are appreciated. I am staying with Genevieve in LA, who I made my features with and wrote the books. My fitful sleep was made more interesting by her two Doberman dogs, Crispy and Crunchy, who decided that the English guest would make an excellent bedfellow. I am sat here at Terminal Five, Heathrow airport and about to board a plane for LAX. Officially, I am flying over to attend the Santa Barbara Film Festival where Gone Fishing is playing. Unofficially, I am also going to LA to be as close to the Oscars as I can get, for the nomination announcements on Thursday. We all find out then, if Gone Fishing has been nominated or not. And I am looking at the newspaper, with a new American President that fills the whole planet with hope for the future. I feel like I am in some kind of dream. I am currently in ‘hour two’ of a fifteen hour journey. All I can do over those thirteen remaining hours is sit around and think… and I can’t help but be reflective of the journey we have all been on over the last 18 months. It’s truly extraordinary. Whatever the outcome on Thursday, I am so very proud of all of us - everyone involved in ‘Gone Fishing’. And I know from the emails I have been getting, many of you are also very proud of our achievement too. Together we created something that has its own life, it reaches out and touches people across the globe. It makes peoples lives better. That is wonderful. Last night, quite out of the blue, an old friend from school contacted me via Facebook. I had not spoken to her in 25 years, and it was great to get in touch. Really great. But she also told me of a few friends who I had lost touch with over the years, had died. It was a shock. People who I went to school with were no longer here. And it was a stark reminder to me, to live in the moment. The here and the now. Even if it is in an airplane seat. Life is a gift never to be squandered. The Oscars will come, they will go, maybe we will get the nomination, maybe we wont… But whatever the outcome, the film will still live on, continuing to reach the hearts of those who choose to spend 13 minutes of their life watching it. This is the real prize. We did it. We really did. We made something extraordinary. So hold on tight, 'cos the BIG one is headed our way VERY FAST! UPDATE - I got into LA and hooked up my laptop to find literally hundreds of 'Good luck' emails. I won't have time to respond to them all just yet, but thank you. I am Jet lagged and feeling really ill right now, so very nervous. Less than 12 hours... Blimey! I have been watching a lot of the Oscars short film winners and nominees from the last few years. They are available to buy on DVD and I also believe via iTunes, though I haven’t checked that yet. I just wanted to see what they were really like, in terms of quality, style, feel etc. The DVD’s are available on Amazon and released by Magnolia Home Entertainment. To say this is an eclectic film collection would be an understatement…In the last few years, winners have included.. The Mozart of Pickpockets (watch a clip here)– a very European comedy about pickpockets who end up having to look after a young boy. West Bank Story (watch here)– a full blown musical (yes singing and dancing too) set in the West Bank, spoofing West Side Story. Six Shooter – dark comedy which led onto director Martin McDonagh making ‘In Bruges’. Here’s my impressions after watching about 15 nominated films. 1. All are very good. I liked some, didn’t like others, but what I didn’t like was a matter of taste and not quality. 2. All were very well produced, with high production values and good sound etc. 3. I may be wrong, but I didn’t see anything shot on lower end digital formats. Most looked like 35mm film to me, perhaps some were Super 16mm? I suspect a few were HDCam. Also, I didn’t watch every film. 4. Off beat humour and feel good endings seemed prevalent, though Wasp, a Brit hard hitting social realist film did win a few years back. 5. Most were on the longer side, 15 minutes and over. 6. None were let down by poor acting, photography or editing. All were excellent. 7. Personally, I feel many shorts are a tad too long. To my taste, most of what I saw here was not at all over long. 8. I didn’t watch the animated shorts of doc shorts. 9. The hard hitting social realist films, which were few, were very good and not at all self indulgent. They felt well researched and truthful, but still depressing to me. All in all, stiff competition for any short film maker. The print has arrived at the Motion Picture Academy of Arts and Sciences. 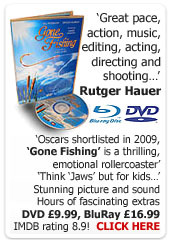 Right now, Gone Fishing is being considered for an Oscar nomination…WOW! And there is still so much work to do. But for now, thank you Kerry for yet again stepping into the breach. You have made a big difference to everyone involved as we can at least rest assured, it didn’t get lost in transit! How does the Academy voting work? 1. Between October and December the Academy holds in house weekly screenings to adjudicate on the short film nominees. There could be anything from 150-200 films eligible, that have been entered. The Academy won't provide outsiders with any details of how the selection process is conducted, what juries are involved etc. However, once they have selected a final short list of 10 films approximately in the Live Action category, soundings are made about the availability of a second print. The last 5 are ultimately informed. 2. The Academy hold a number of screenings for their members, to expose them to the short films nominated. There are a couple of theatrical screenings in L.A., one in New York and one in San Francisco. 3. The Academy don't send screeners of the shorts to their members for them to review. 4. Members have to attend the official screenings. There they review the films and are given the ballot papers on which they cast their votes. You have to be an Academy member to get into the screenings in the first place. 5. The Academy members (5-6,000 approx) are very much in the older age group, as a demographic. Some are not even in the industry any more or are retired. I think the nostalgic theme of your film would be a big advantage from the point of view of the Academy members' age profile etc. Phew! Let me take a moment. Does that mean ALL the Associate Producers too? If it did, we would have an enormous problem as we would need to get 175 contracts out ASAP! Producer Ivan Clements called the Academy and the confirmed that it’s only the named Producer that needs to sign (along with the director and copyright holder). Ivan wrote… Hi Michelle, Thanks for talking. Can you please confirm that you only need the 'producer' to sign and not Exec Producers or Assoc. Producers. Sorry, it's our first time and we want to get it right. That is correct, only the director and producers need to sign. So off it goes, to Kerry Finlayson in LA, who will hand deliver it for all of us, all the 175 people who funded the movie, the 200 crew who made it happen, the 20 actors involved… When stacked up, there are a lot of people who have chosen to invest in this journey with me. I dearly hope the next chapter will be the most exciting yet! I am filling out the application for the Oscars 2009, for ‘Gone Fishing’. Once it’s sent off, not much will happened for the next three weeks or so, but then, a whole new PR machine will begin to roll out, both here and in LA. I will be in touch about his in the coming weeks. So here is the rough timeline. 1. Some time before Feb 22nd (probably in Dec), we may get a call to say we are in the final shortlist (which according to rumour could be between 10 and 20 films). This shortlist has been ‘judged’. Effectively, the Academy is saying, don’t book a holiday in Feb! At that point we need to send a second 35mm print over. If we don’t get this call, we are not shortlisted and will not get nominated. 2. On Jan 22nd, we watch TV and find out IF we are in the final five and have a nomination. If we ARE nominated, WE ARE GOING TO THE OSCARS! If we are not, it’s been a rollercoaster for sure, and it’s time to regroup for the next campaign. 3. If we do get nominated, we step up our PR campaign in LA and we go to the Oscars on Feb 22nd… Hearts will be pounding for sure. In due course, I plan to write up an explicit timeline of events for film makers who follow after, as it’s been hard to piece together exactly what happens and when and by who. I must admit, I do feel considerable fear and trepidation. I have got his far, but what if we don’t even get into the final few? What if we stumble at the first hurdle? I feel under prepared, under funded, a stranger in a strange land… But I also know that all of these feelings are in fact my allies, they remind me that I am playing the game to win, that the game I am playing is THE BIG ONE… What fun is there in a game where you know the outcome because you have mastered it before? Or a game that you can ‘buy’ into through personal connection and wealth? Better a game where the odds are stacked against you, that way, even in defeat you also win. And so, I also just reflect on that fact that the fish in Gone Fishing is called Goliath… rather apt. I am leaving today for the Oldenburg Film Festival, and who knows what internet connectivity I will find, so it may be a couple of days before my next blog entry. I just wanted to let you know that the Oscars deadline as at the end of this month, and we are furiously researching tactics and best practices. When we have our information, we will post it. But for now, I though I would just share a PDF interview from the Guerilla Film Makers Handbook, with a previous Oscars Short Film Nominee, Ashvin Kumar, director of The Little Terrorist. It’s pulled form the recent green UK book and makes for a fascinating read. Finally, I just had a long chat with Kerry Finalyson, Brit film maker and actress, on the ground in Hollywood. She has already helped out on Gone Fishing by being an associate producer, but she has also helped by attended screenings and other stuff in LA. She has now agreed to spend time researching and interviewing film makers, academy members, PR people and the like, in order that we formulate a better Oscars strategy. Yes he really was dying, but he got the operation! You can read his post from last year here. Of the sixty or so Oscar Qualifier festivals that are left, only 12 are left with deadlines that we can meet. But why bother you may ask, as we already have an Oscars qualifier win with Rhode Island? There appears to be a huge amount or rumour and speculation about how the films get shortlisted and then selected for nomination – should I try and win more festivals? Should I run a campaign in LA? Should I go to the screenings personally? Everyone has an opinion and I am listening intently to them all. You can be sure though, we will do anything and everything to make this happen, and in line with Rhode Island, where possible we will video blog it all to take you on the ride with us. Now it’s time to hit Withoutabox and get submitted to those last 12 festivals! Gone Fishing... The Final Awards... Did we win BEST FILM? So it’s all over. What an incredible journey. And we won! We are now officially in the race for the nominations for the Oscars 2009. Can you believe it? I certainly can’t. After the awards, I went back to my room and crashed out for 2 hours, I had burnt up so much energy during the event! I am back in the UK now, jet lagged and phased,but with a whole new agenda stretching out in front of us. Now we really need to ramp things up as getting the nomination for the Oscars is also about being visible in Hollywood, and that’s going to take some magic. Blimey. I mean really. Blimey! PS - Finally, if you have been watching these webisobes, drop me a line to tell me what you have thought of them, what you have got from them. Today I got the emailed letter from Laemmle theatres confirming that Gone Fishing screened in LA – this is needed for the application to the Oscars. A copy has been forwarded to AMPAS (the Academy of Motion Picture Arts and Sciences) and you can read the letter here is you are interested. Now we need to fill out the Oscars application form too, a copy of which is here (again for those interested). 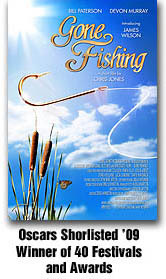 Producer Ivan Clements also suggested we supply a 35mm print for screening to the Academy, and not a DVD – this will mean that Gone Fishing must be screened in a theatre for judging, and can’t just be viewed at home. Of course, I hope that does not mean that some people who need to see it, just don’t get to see it as they don’t make the screenings. We need to look into this further. The BAFTA’s are looming too, and we will need to make our application for the 2009 awards between 1st Sept and 31st Oct. You can read their full rules and regs here. We are making final arrangements for the Kodak Awards, the main award being an audience award, and so it would be great to see you all there. More on this in the coming days.